The lawyer representing the leader of the Indigenous People of Biafra, Nnamdi Kanu, says he has not communicated with his client since September 14, when Mr. Kanu’s Abia State home was “invaded” by soldiers. The lawyer, Ifeanyi Ejiofor, was reacting to reports that Mr. Kanu had gone into hiding. In a statement Tuesday, Mr. Ejiofor claimed his client was abducted by military operatives on September 14. He said “Mr. Kanu has probably been killed”. Mr. Kanu was last seen in public on September 10, after his supporters clashed with soldiers. Mr. Ejiofor said some IPOB supporters were killed the clash. 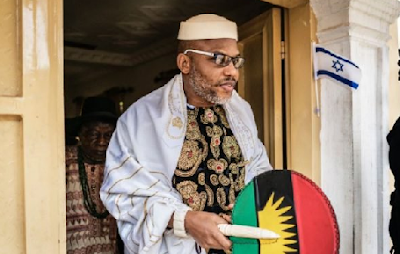 However, a letter purportedly signed by Mr. Kanu, quoted the IPOB leader as saying he would not be attending an earlier scheduled meeting with South East governors last Friday. “In view of the concerted effort by the oppressive Nigerian state to shatter the peace and tranquility of the South-East and the rest of Biafraland through military intimidation, it has become necessary for me to clarify why, regrettably, I may not be able to attend Friday’s meeting with the South-East governors as earlier agreed, for three main reasons,” , the letter, published by Punch newspaper, said. Mr. Ejiofor said he could not confirm the authenticity of the letter as he had not been in contact with his client since September 14. Mr. Ejiofor said Mr. Kanu was abducted, and claimed that reports that his client had gone into hiding were merely aimed at “diverting the attention of the public”. “I have no doubt whatsoever that stories making round that my Client has fled outside Nigeria, were planted to divert attention from their murderous raid on my client’s house. I made last contact with my client few minutes into the bloody onslaught in his home on the 14th day of September 2017. Till date, I have not established further communication with him. “The soldiers must have made possible contact with him on this 14th day of September 2017, when they invaded his house on a bloody raid, and by virtue of which position, they should tell the world if he was caught by fire of bullets in the hit of the bloody onslaught or he was arrested alive. “In all probability, my client may have been killed by the invading soldiers who are now seeking ways to fool the world into believing that he has left the country. My request is that the military should produce my client wherever they kept him and stop diverting attention of the public,” Mr. Ejiofor said. » The First Blast ¡®Killed¡¯ Me, But The Second Woke Me ¨C Jos Blast Victim!. » Smart Woman! Serena Sells $12m Home To Buy $6.7m New Home & She Probably Will Sell That Again!